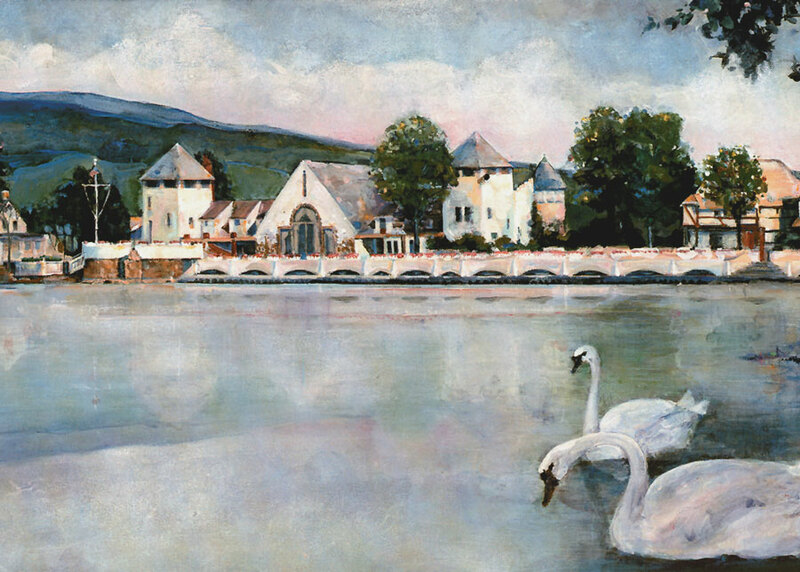 Painting by Lake Mohawk artist Drue Chryst depicts the boardwalk. To walk along the Boardwalk at Lake Mohawk in Sussex County is to step back into another time, a time when the pace of life was a tad slower and less complicated. While the Lake, Boardwalk, and adjacent White Deer Plaza are old, they are not ancient. The Lake is, in fact, man-made, dating from the mid-1920s. And before the Lake there was the valley: Brogden Meadow (so named for a colonial judge who settled there), 2300 acres and three miles long, rimmed by wild and wooded ridges, and the source of the Wallkill River that flows north through the Wallkill River National Wildlife Refuge and into New York state. In January 1926 the Arthur D. Crane Company, under the direction of developer and designer Herbert L. Closs, began the work that would result in this largest of private artificial lakes in New Jersey. The river was dammed at the northern end of the valley and the lake bottom cleared. The private resort community opened on June 26, 1927, with a young full-blooded Mohawk woman, Princess White Deer, in attendance. She sang on Broadway in a number of shows, including the Ziegfeld Follies, and the Plaza was named in her behalf and the lake in honor of her tribe. The Plaza expanded between 1926 and 1935, and the private planned community grew, too, as more summer homes were added. Originally, houses cost only $3500--a princely sum back in the '20s and '30s. 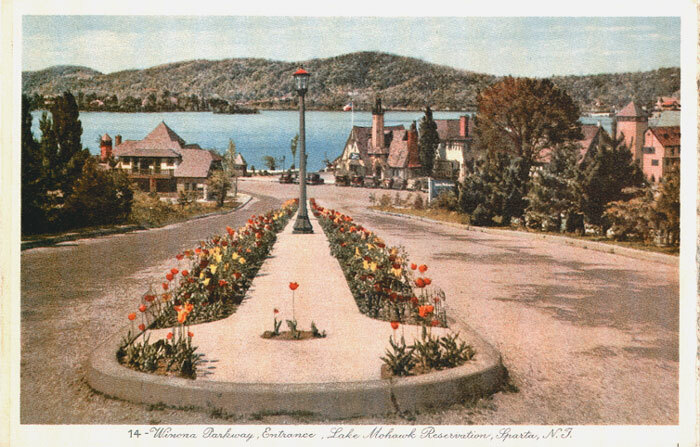 Winona Parkway entrance to White Deer Plaza looks much the same way as on this old postcard. In 1988, Frances Smith, General Manager of the Lake Mohawk Country Club, in conjunction with local historian Wayne McCabe, worked to get the Plaza, Country Club, and the buildings placed on the New Jersey and National Register of Historic Places. The district qualified because of its unique architecture, a style which has been called "Lake Mohawk Tudor," a fanciful amalgamation of Tudor, English Cottage, and German Baronial styles, as well as structures in the Vernacular style. Lake Mohawk Tudor buildings employ half timbering, variegated slate roofs, gable roofs, stucco siding, decorative brick and stone work, among other interesting architectural elements. Drive down the district's sloped main entrance of Winona Parkway, off Route 181 in Sparta, to get a glimpse of the lake beyond, and into White Deer Plaza. Head right along the broad street, divided by a narrow median, for a quick tour of the historical district. #9 White Deer Plaza - Today this the St. Moritz Grill and Bar. The building is circa 1930-1935, with a multi-color, variegated slate roof, stucco siding, half timbering, all in the Lake Mohawk Tudor style. Across from the St. Moritz is a line of buildings, circa 1928-1930. These are also in the Lake Mohawk Tudor architectural style--hip-roofed buildings, displaying flush eaves, stucco siding, variegated slate roofs, and other unusual features. The restaurant on the corner has interesting brickwork, while the Plaza Delicatessen sports gable dormers. Note the diamond-paned casement windows and painted shutters (with heart cut-outs) at the pet center. The attractive wooden gate there is also remarkable for the heart, tree, and flower cut-outs, as well as the painted grapes and vines embellishing it. Formerly a service station, the building at the corner of the Plaza and West Shore Trail also dates from this period (1928-1930) and has a multi-color slate roof and hip dormers. The carport in front is supported by huge corner towers, with a thick chain draped between them. Across the way are two small eateries, and again these structures are in the Lake Mohawk Tudor style, with a wooden balcony running the length of the ice cream parlor's second story. #24 White Deer Plaza - The realty office was the administration building for the project. Built in 1928, this Lake Mohawk Tudor structure has the multi-color slate roof, a semi-hexagon bay window, half timbering, diamond-paned window, and other architectural details of interest, including a bell in a dormer that faces the Boardwalk. Park at the beginning of the Boardwalk, in front of the real estate office and turn and look back toward Winona Parkway. #23 White Deer Plaza - Today this building, with its pitched gable roof and half-timbered facade, is Krogh's Restaurant and Brew Pub, originally the site of The Tea Room and Gift Shop (built circa 1927), the first commercial building on the Plaza. Eventually the Tea Room became the Carl Malmquist Restaurant, and then in 1937 Frede Krogh purchased the tavern and renamed it Krogh's Restaurant and Tap Room. In 1981 Bob Fuchs, the fourth owner, purchased the restaurant; subsequently in 1999, it became Krogh's Restaurant & Brew Pub, with a state-of-the-art microbrewery on the premises. Among its many brews is Brogden Meadows Pale Ale--a tip of the hops hat to the district's historical origins. Swing back to face the lake now, and notice that to the left of the Boardwalk stands a stucco kiosk (circa 1928) with variegated slate hip roof. Past the kiosk on the left go through a pergola gateway, down stone steps and across a foot bridge (over a pond) to a sunken garden, complete with Japanese maples and Norway spruces. 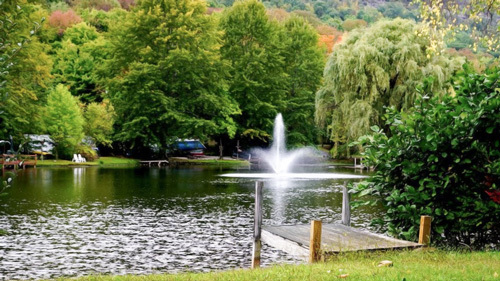 This verdant retreat was built over a period of years, from 1929 to 1935, and in the small garden stands an immense boulder, with plaques dedicated, on the 60th anniversary of Lake Mohawk, to Herbert L. Closs and Arthur D. Crane, the "fathers" and developers of the area. A pier runs the length of the garden. From the garden go right and up wide steps to the Boardwalk, a leg-stretching 1000 feet with herring-bone design. Once upon a time it was 2500 feet long, wrapping sinuously around the Lake, but in 1957 was shortened and reshaped to its present length. Take a leisurely stroll, or perhaps pause to sit for a while on one of the many park benches there and watch boats out on the beautiful lake. The Boardwalk, owned and maintained by the Country Club, is actually semi-private, because some of the businesses along it are open to the public. Manitou Island can be seen not too far distant, a green jewel rising out of liquid blue. A bridge off of West Shore Trail leads to the Island, which is closed to the general public, as is the stretch of road past that. The Lake Mohawk Country Club (circa 1928-1933) cannot be missed--its great size suggests a medieval castle, and indeed, the imposing building looks like something out of a fairy tale book. Cream-colored, the Lake Mohawk Tudor/German Baronial structure rises three stories, with four-story crenelated corner towers, a Palladian window (facing the lake), dormers, turrets, decorative slit windows, two unique brick chimneys, as well as a variegated slate roof. The main entrance is off of West Shore Trail, with plenty of handicapped parking alongside a grassy expanse. The 800-acre lake is stocked with numerous fish, including striped bass, and has a catch and release policy. The lake also features ten beaches, powerboating, sailing, water skiing, and various clubs for its 2600 member families. Past the Country Club, the Boardwalk is not the straight ruler length, as is the case with other boardwalks, but in an S shape that reveals a bathing beach tucked into a curve and then flows down to a foot bridge over the spillway, complete with sluice gates and wheel apparatus. Ducks sun and preen themselves there, at the headwaters of the Wallkill River. The Boardwalk ends shortly after that with a children's small playground, complete with swings and slides and an elaborate jungle gym, and a corner pavilion with a copper-capped belfry. A stone pergola gateway gives out to West Shore Drive. The mostly private road leads the sightseer on a visual tour of charming and well-appointed summer homes, many now used year around, for some ten miles before ending back at White Deer Plaza. Enjoy some of the renowned restaurants, shops and and galleries in the historic district. Then afterward, as you immerse yourself in the history of a time long ago, grab a slice of pizza or an ice cream cone, and sit on a Boardwalk bench and watch as time--and white-sailed boats--slip on by. Thousands of photos and artifacts document the lake's long and illustrious history. Open every Sunday through June, 12-4pm, October thru May. Free admission, parking. There's always something fun happening at the Sussex County Fairgrounds. Visit our web site for a full year of family fun, right in your own backyard. 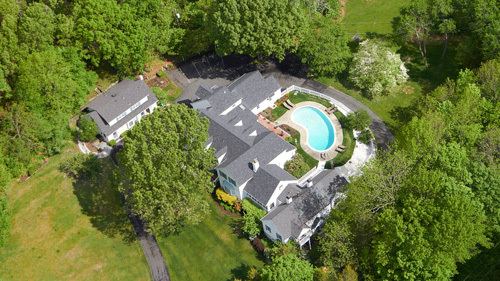 Secluded ten-acre mini-estate adjacent to Kittatinny Valley State Park offers ten spacious guest rooms with private baths, some with fireplace, 2-person tub, and balcony. In-ground pool, country breakfast, free wireless Internet, bike/horse/walking trails. Corporate meetings are also welcome! 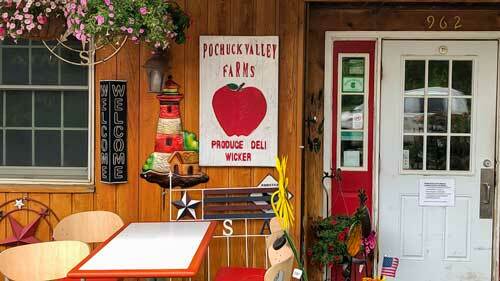 Peaches starting in July, home-grown fruits and vegetables, deli and home-made pies and baked goods. Pick your own apples, pears, and pumpkins in fall as well as our own cider. Pochuck Valley farm-raised pork and chicken. Outstanding family facilities near Culver Lake and Stokes Forest include over 200 sites on 160 acres, cabins, trailers, tent sites, camp store, laundry, hot showers and full range of on-site activities.